Today is National Pet Day. The event is celebrated in the USA and that another western practice we would not mind adopting at all. The event is celebrated to encourage people to adopt pets from local rescue shelters and make donations to animal welfare organisations. A great initiative, we say. Kriti Sanon is one of the Indian celebs who took to their social media pages to share a post about National Pet Day. We are so happy to meet her pet dog, Disco, through her social media page. Over the years many celebrities have introduced us to their beloved pets. Kriti Sanon Believes she Should be Equally Credited like Kartik Aaryan for the Success of Luka Chuppi. So, using the National Pets Day as an opportunity, we'd like to bless you feed with a dosage of cuteness. 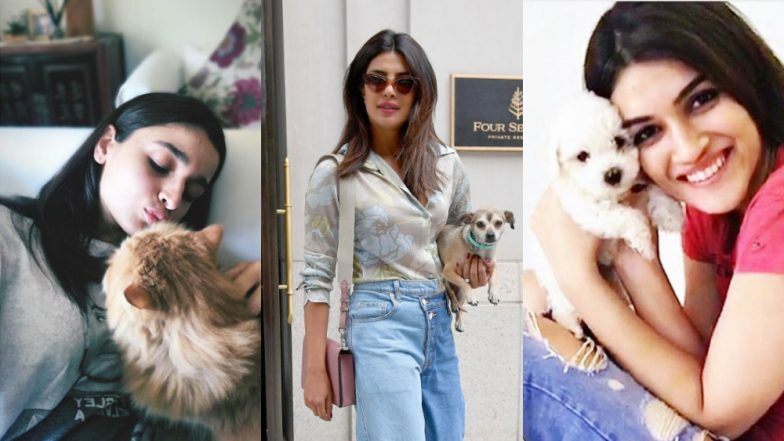 These pets keep showing up in Instagram stories and posts of Jacqueline Fernandez, Alia Bhatt, Shraddha Kapoor are just a few ones who shower love on their pets online. So, we are sure you are feeling an urge to go hug your pet right now. Blessed are those who are reading this feature while cuddling with their animal friend. For the rest, we'd have to wait until we reach home in the evening after school or college. But the main point, is to show extra affection to the most non-judgemental souls in your life - your pets. Also, make sure to use this opportunity to educate people around you to treat their pets properly - with love, care and respect. Encourage your friends to adopt from local rescue shelters instead of buying expensive breeds. Donate to animal welfare organisations, if you can.